The domestic acquisition of MRAPs, Armored Personnel Carriers, Grenade Launchers, and Sniper Rifles, have finally gathered the attention of law makers in DC. The realization of a standing army in the supposed “Land of the Free” has since become mainstream, after last month’s show of military force police presence in Ferguson, MO. A Senate hearing took place Tuesday to discuss the unaccountable and irresponsible billions in military gear given to local police departments throughout the country under the DoD’s 1033 program. 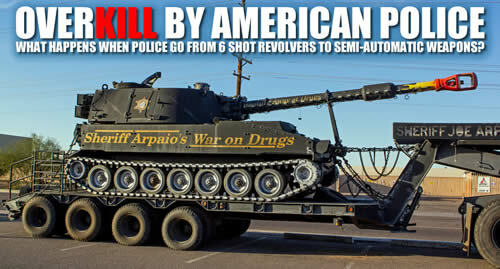 According to USA Today, lawmakers and witness suggested that programs have run amok, haphazardly doling out military equipment that has transformed some local police into paramilitary forces. The federal government will no longer provide heavy military equipment like tanks and grenade launchers to local cops following weeks of backlash against officers who confronted protesters in Ferguson, Missouri, in armored vehicles and camouflage last year, President Barack Obama said Monday. And if they want other, less-imposing military equipment, local law enforcement agencies will have to submit to stringent federal oversight and restrictions, according to the White House. The weapons used in the “war on terror” that destroyed Afghanistan and Iraq have made their way to local law enforcement. 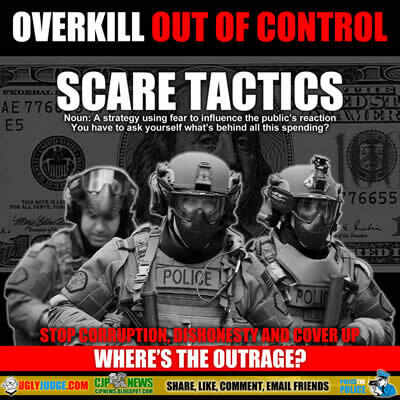 While police forces across the country began a process of militarization complete with SWAT teams and flash-bang grenades when President Reagan intensified the “war on drugs,” the post-9/11 “war on terror” has added fuel to the fire. Through laws and regulations like a provision in defense budgets that authorize the Pentagon to transfer surplus military gear to police forces, local law enforcement are using weapons found on the battlefields of South Asia and the Middle East. A recent New York Times article by Matt Apuzzo reported that in the Obama era, “police departments have received tens of thousands of machine guns; nearly 200,000 ammunition magazines; thousands of pieces of camouflage and night-vision equipment; and hundreds of silencers, armored cars and aircraft.” The result is that police agencies around the nation possess military-grade equipment, turning officers who are supposed to fight crime and protect communities into what look like invading forces from an army. And military-style police raids have increased in recent years, with one count putting the number at 80,000 such raids last year.